Long Tail Product Features are the unusual features of your products or services that you may take for granted because each one only of interest to a small number of prospects. They are what your products and services can do that maybe you haven't thought about before. Probably because each ones is only of interest to a few of your prospects who have particular needs. But when you look at these long tails in total they can represent a very large proportion of the prospect base that you focus your sales efforts on. So your prospects could mention a small but important requirement that passes you by as you haven't connected the features of your products to that particular need. But with more sales training on discovering the smaller and more obscure features, each of which may only be of benefit to a few potential customers, you can have a ready-made advantage to use in your sales presentations that in total works for a large number of your prospects. What makes these long tail features so effective towards closing sales is how specific they are. Your prospect has a specific need, something small but important to them, and you can fulfil that need. With the right sales training you will learn to spot the specific need, match it to a feature that you can deliver, and explain the benefit the prospect will receive. And that makes you stand out from your competitors. They're called long tail product features and benefits because long tail is a term used in online marketing to describe a massive group of keywords that are each used only rarely in online searches. At one end of the scale you have major keywords, for example a major keyword for my website would be sales training. So I obviously use sales training in the text, descriptions, and headlines on www.Provensalestraining.com. Like all major keywords there is a lot of competition for them. The same is true of your product's major features and benefits. Your competitors will also have them and their sales people will all include them in their sales pitch, their needs questioning, and their presentations. Online the long tail keywords are the ones that are not used often to search and they can be very specific to a need searchers have. On their own they don't create many visitors, but added together long tail keyword searches result in more visitors to my website than the major keywords do. So I weave many of these long tail keywords into the text of the web pages. In the real world when you're selling face to face or via telesales calls you don't need to weave these lesser requested features and benefits into your sales pitch. If you follow a proven sales process using stages, that include Questioning your prospect's needs, you will discover these more specific, rarer needs, wants, and desires. To be able to use them to close sales easily you will need to know the features of your products and services that will provide these rare and specific benefits to the customer. There is a way to do that and give yourself a competitive advantage over your competitors, just as it does for online marketers that use the long tails, because you will be able to instantly present a feature and benefit to meet a very specific need. Very few sales trainers include ways to help you learn the long tail product features and benefits. It's one of those techniques that only trainers that have worked in selling, and have hands-on experience, include in the techniques they teach. So investing some time into learning this technique will give you a advantage over competitors and colleagues that haven't received training on how to do this. 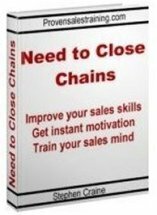 There is a sales training eBook, that I offer to you as a visitor to this site free of charge, called the Need to Close Chains. As you go through the exercises in the book you will be asked to think of needs, wants, and desires that your prospects may want. Start this process with obscure, specific, unusual, rare, and sometimes illogical needs that your prospects may have and complete the exercises. This technique will build new mental pathways and help you to remember and be able to use these new connections between long tail needs and the features and benefits of your products.